DTE Energy plans to build a $1 billion power plant in East China. A 1,100-megawatt power plant is one step closer to being built in East China Township, and officials say that it will create hundreds of jobs while contributing to reduced carbon emissions. Detroit-based DTE Energy is the company behind the natural gas-fired power plant. More than 500 full-time construction jobs will result from the development, which is estimated to cost $1 billion. When complete, the new power plant will provide power for 850,000 homes. East China Township supervisor Larry Simons touted a strong relationship with DTE Energy. He asserted that the project will strengthen the economic vitality of both the region and the township. Jeff Bohm, commissioner for St. Clair County, echoed those statements. "This is welcome news for all of St. Clair County--and all of Michigan. The new, cleaner natural gas power plant will create hundreds of jobs and provide additional revenue that we can put toward improving our roads, schools and other essential services," Bohm said. "With three coal-fired plants scheduled to retire, we need the affordable, reliable energy that natural gas plants provide. This $1 billion investment is a significant boost to our community and helps assure continued job growth while ensuring we can meet our state’s energy needs." According to the Economic Development Alliance of St. Clair County, the new power plant reaps many benefits for St. Clair County. "An infrastructure project and investment of this size and nature not only benefits the families and communities of St. Clair County with affordable, reliable and cleaner energy for generations to come, it boosts and sustains economic growth locally and for our entire region and state," says EDA CEO Dan Casey. 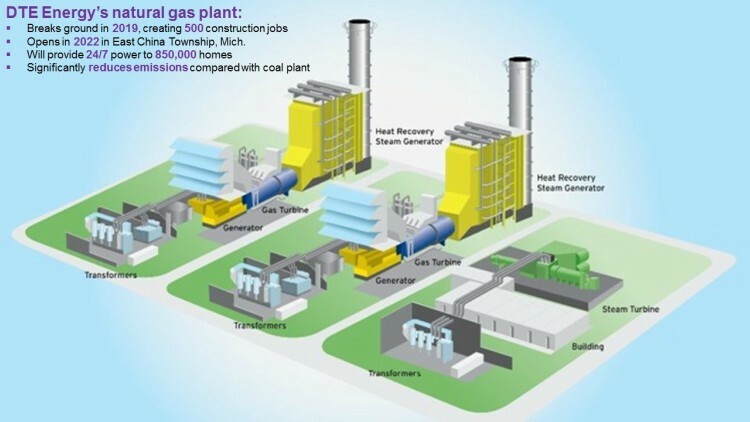 DTE Energy’s natural gas-fired power plant was approved by the Michigan Public Service Commission this past Friday, April 27, when the organization officially approved the company’s Certificate of Necessity request. The MPSC is part of the Department of Licensing and Regulatory Affairs for the State of Michigan and regulates natural gas, investor-owned electric, cooperative electric, and long distance and local telephone utilities. "We are thrilled that this proposed plant has secured critical state regulatory approval and is one step closer to reality," Casey said.